Great three bedroom home on Lake Hamilton. Has dock, large backporch with outdoor kitchen and plenty of comfy furnishings for entertaining your friends. Great large kitchen with all the amenities. Large open living area with 65" TV. Courtyard entrance with fire pit. Cozy fireplace area next to kitchen to enjoy your morning coffee. Master suite has large jacuzzi tub. 6 miles to Oaklawn Park, nearby grocery and liquor store. Many great restraunts nearby. Quite neighborhood. Small pets welcome. Fenced side yard with doggie door. Hi, I'm Gina. I live here with my dog Tink. She is a miniture schnauzer and is hypo allergenic. We love to travel and would like to share our great home with some good people. I was born in Hot Springs and have many friends and lots of family here. 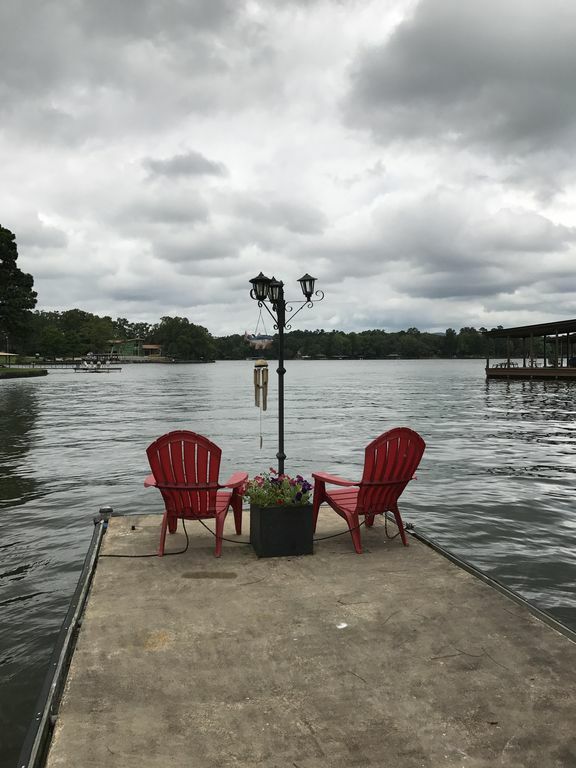 This is a great place to hang with friends and enjoy Lake Hamilton. There are two neighboring houses which are also available to rent. This would be great for family reunions. I bought this home because it is unique in layout ( guest bedrooms are privately located down the hallway) and it has a unique combination of a quiet neighborhood yet very close to what's happening in the area. Great part of Lake Hamilton yet somewhat hidden from the traffic. The back porch is big and very comfortable with the lake only steps away. The street it is on is a great place for walking and jogging. This is a very safe place to live and play. The courtyard in the center of the house is one of my favorite places. It is private and a great place to enjoy the night sky. Vegetable garden is happening during the summer with fresh tomatoes and squash, peppers and okra in season. I leave plenty of towels for your use. I also leave a backet of beach towels on the back porch to use off the lake. Many spices to use for cooking. There is a vegetable garden in season. there may be fresh vegetables to eat. Tomato, squash, peppers and okra. Large open kitchen. I leave many spices to use. lawn is small leading down to the lake. Vegetable garden when weather permits. two person fishing kayak, big tube for boating fun. House was great! Easily accommodated three couples. This house was just perfect for our family!! I highly recommend it. The floor plan of the house was perfect for a family. We always were comfortable, whether it was inside or outside. The kitchen was fully stocked and the bedrooms were super comfortable. We all had a great time!! We had a great time. Your home was everything we could have asked for. I highly recommend this home. Thank you Vickie!!! It always makes me happy when folks enjoy my home. You must come back soon. Enjoyed meeting you and your family. The best stay on Lake Hamilton! The house and owner are absolutely wonderful. We could have spent the entire week just relaxing on the back porch! Definitely recommend. Thank you Chelsea and family. It was a pleasure to meet you. I’m so happy you enjoyed your stay. Please come again soon. Loved this place, the porch was the best part. Lots of room and a pretty view. We had a great time here. Thank You so much for the great review!! It's always a pleasure to me when my guests enjoy the property. WE HAD A GREAT TIME AT MS GINA PARKS VRBO. GREAT LOCATION, VERY PEACEFUL. HOME IS IN GREAT CONDITION AND WELL FURNISHED. THE PATIO IS TERRIFIC. MS GINA IS VERY HELPFUL AND CONSIDERATE. ONE DAY OF FOUR A BIT NOISY DUE TO NEIGHBOR HAVING NOISY FAMILY REUNION PARTY. BUT OTHERWISE WAS VERY PEACEFUL. GREAT EXPERIENCE. Thanks You for your great review. I am very happy you enjoyed your stay. The neighbor is usually very quiet. Sorry if they disturbed you. Hope you come again soon. on Lake Hamilton, there are boat rentals nearby, fishing is great from the dock, there is a place to tie up a boat. Great safe swimming place for adults and children. Nearby grocery store, liquor store with great wine selection, bbq etc. Vegetable garden in season. Herb garden.